SofType 4.5 has been designed specifically for use with both US English and other languages. SofType has the same capability to enter text into Windows applications as SofType 4.2. Please follow the link for more information about SofType 4.2. SofType 4.5 uses the "Input Locals" capability within Windows for specific characters and their keyboard locations in each language. SofType 4.5 and Windows work together to automatically make these keyboard changes once the input locals have been properly configured. If SofType 4.5 is only used with one language, configuration is not required. If multiple languages are used on one machine, then SofType 4.5 will change the keyboard layout as applications associated with different languages are used. When focus is transferred between applications the keyboard will change to the language associated with that application. These changes are handled automatically by Windows and SofType 4.5. Windows installations that generally use the Roman character set are compatible with SofType 4.5. For more information regarding the use of multiple languages please refer to "Input Locals" within the Windows Help system. The two examples above are indicative of the keyboard layouts available using SofType 4.5 with Windows Input Locals feature. Although not shown in the two examples above, the word lists can be setup for one language or for each language used on one machine. SofType is a software utility which replaces the functionality of a standard keyboard with a full featured on-screen keyboard. SofType can be accessed using a mouse or mouse emulator such as the HeadMouse™ Extreme. SofType is compatible with Windows XP, Vista and Windows 7. SofType works by generating an image of a keyboard on the computer screen. When a key is selected, the character represented by that key is sent to the active Windows application. The Default layout with word prediction enabled and Dragger disabled. A qwerty layout with word prediction enabled and Dragger disabled. Menus are suppressed and shifted characters are shown. 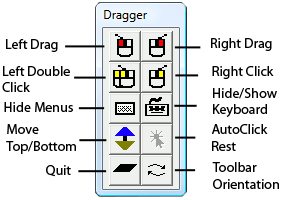 Menus are suppressed and Dragger toolbar docked in the keyboard. HeadMouse is a registered trademark of Origin Instruments Corporation. PageBot, Swifty, Beam, Orby, Breeze, SofType, Dragger, and AirVoter are trademarks of Origin Instruments Corporation. All other trademarks are the property of their respective owners.